One thing that happens with mixing paint is people reach for white or black too quickly when they are mixing colors. The biggest thing to remember is white or black will desaturate your color mixtures very quickly. When mixing your colors mix your hue first remember the colors your mix together will affect the value and chroma of the final color mixture. Get as close to the color you need before you add white. Also remember when you add white the color will get lighter but will also get cooler oranges, yellows and reds will shift more than other colors. So if I am adding white to an orange mixture the mixture will get cooler. After adding white I will have to add a warm yellow to shift the mixture warmer. It’s intuitive like with cooking you make the soup and then taste it sometimes it needs a little more salt, pepper or whatever. It’s the same thing with mixing color. Just remember to add white at the end of your mixture. To avoid times when you might add white to early in a mixture. If I am creating a very light blue green for instance and using a dark blue such as thalo or ultramarine. These colors are so dark in value it is hard to see what the color is doing when it is so dark. I could lighten the mixture with lemon yellow but that will also shift the mixture more yellow. I might add a little white to make the blue higher in value just so I can see the hue a little clearer and control my mixture much better. The paint color Black has gotten a bad rap over the years. There are two camps those that swear that black should never find its way onto your palette and others that say good paintings can’t be done without it. I say good paintings can be done with or without black. I do enjoy having black on my palette. You can certainly paint without black and many great artists don’t use black. However there are just as many great colorists and impressionists who used black including Degas, Manet, Zorn and others. The best thing to remember is add black to a color mixture containing one or two other colors. Avoid having white in the mixture since that will lower the chroma or intensity of the mixture considerably. Use black with a transparent color like alizarin crimson or ultramarine blue and others this will give the black more translucency and add some depth to the black. Also remember in your mixtures that black is nothing more than a very dark low intensity blue. So remember black is a blue use it that way in your mixtures. By understanding how to use white and black and how they affect your color mixtures you can use them effectively to lower and lighten the value of your colors while controlling their intensity. This will give your paintings more depth. You hear a lot about the terms warm or cool colors. There is a broad definition and a more detailed explanation for warm and cool colors. The basic definition for your primary colors are red is warm and blue is cold some refer to yellow as warm but I consider it a neutral color meaning it can lean either warm or cool. Next you have your secondary colors Orange is warm and Violet is cool but once again I consider green to be neutral because it can be warm or cool. There is a more detailed definition of warm or cool and it is applied to every color on color wheel and the colors you have on your palette. Here is a break down of the warm an cool versions of each color. Colors can be warmer or cooler in context to one another, you can take a cool color from a overall warm painting(one with mostly oranges and reds) and put it in an overall cool painting(one with a a lot of purple and blues) and the color that was cool in one context can be warm in another. Below is a good example. Chroma is an important aspect of Color. Remember chroma and intensity mean the same thing, it is how bright or dull a color appears. By having a variety of intensities with your colors you increase the the depth of your color relationships in your paintings. You seldom hear mention of the chroma or intensity scale so let’s explore what it means. The Chroma wheel shows the primary colors decreasing in intensity or chroma down threw the chroma scale to a neutral gray. Pictured above in the color wheel are the primary, secondary and tertiary colors progressing from their most intense down the 5 steps to neutral gray. 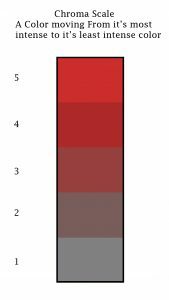 There are several levels of intensity but for the chroma scale we will use a five steps of intensity. Step 5 is a color at its most intense Step 1 is neutral gray. Since chroma doesn’t refer to value or hue a very light violet may be a step 4 on the gray scale as well as raw sienna and venetian red though the colors differ in hue and value they are the same chroma or intensity. Try to ignore the color’s differences and instead focus on their similarities. Their intensity, by learning to observe a color’s intensity you will be taking a large step in understanding color. Color is has three very distinct personalities or characteristics. 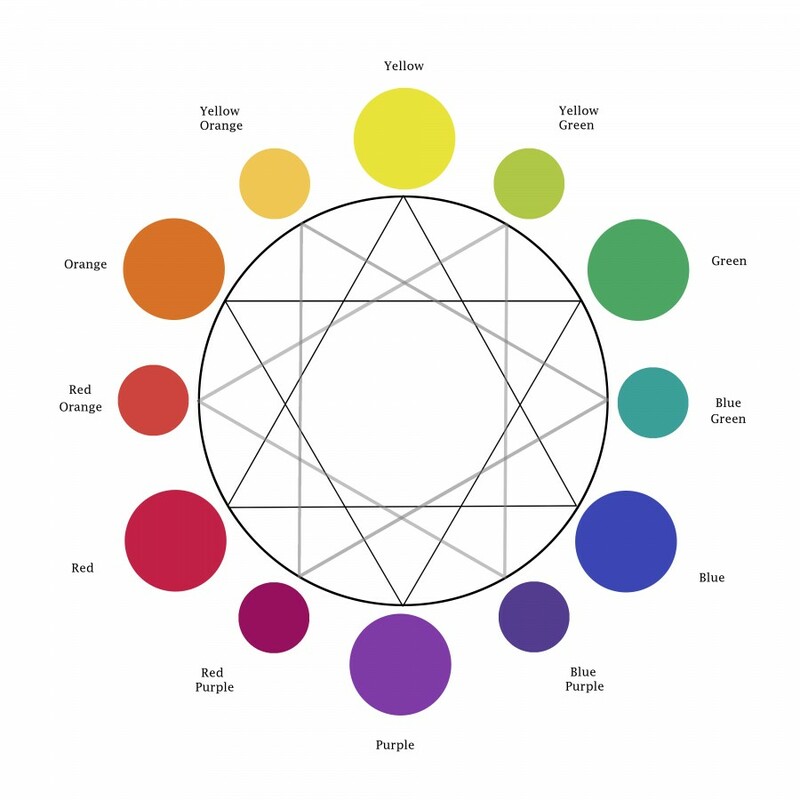 This is why color has so much complexity however by understanding these aspects of color and how to identify them you can better understand the colors you are seeing. Understanding is more than half the battle in the world of color mixing. The three aspects of color are hue, value and chroma. With the exception of black and white every color has these three aspects. So let’s shed a little light on what these things mean. Hue is what family the color is apart. 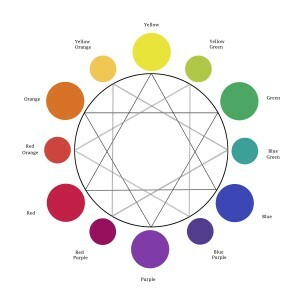 Is the color red, yellow, blue, green, violet, or orange, whether a color is dark or light, dull or bright every color will belong to one of these 6 color families. Practice viewing color and describing in which family of color it belongs. Chroma or Intensity is the second attribute of color. It is how bright or dull a color appears. Colors can be quiets grays or loud vibrant and colorful. All these variations of a color’s chroma or intensity makeit a very expressive aspect of color. Value is the last and the most important aspect of color. If you get you values right in a painting you can do all kinds of things with chroma or hue and still create a very convincing painting. A great example of this would be the work of California Impressionists such as William Wendt. The combination of these three aspects are contained in the millions of colors we find in the world around us. Understanding hue, chroma and intensity will help you to accurately identify color. Grayed or colors of lower intensity are important way of controlling you color. The more intense colors catch more attention when they are surrounded by colors with lower intensity. 80% percent of you colors in representational painting will contain colors of lower intensity or chroma another words “grayed” colors. Now when I say “grayed” I am not talking about battle ship grey. I am talking about any color not being at it’s most intense shade. 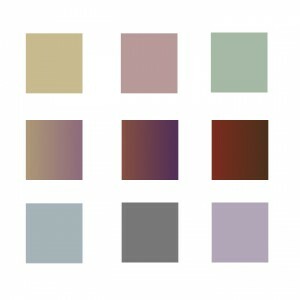 Below are some wonderful grayed colors. Earth tones in this example would be included with grayed colors. Grayed colors will give you paintings more variety and better cohesion. Colors in nature are rarely straight out of the tube. Your primary and secondary colors are too intense to look natural. When painting, you are constantly modifying your colors and graying their intensity to create paintings that are harmonious. First, lets look at the definitions of color. Primary Colors – These colors cannot be mixed. They are the colors from which all other colors are made. The primary colors are red, yellow, and blue. Secondary Colors – These colors are mixed from the primary colors. The secondary colors are orange, green, and purple. Tertiary Colors – These colors are the steps between the primary and secondary colors. The tertiary colors are red orange, yellow orange, red purple, blue purple, yellow green, and blue green. Complimentary Colors – Colors directly opposite one another on the color wheel. The compliment of red is green. The compliment of blue is orange. Analogous Colors – Colors near one another on the color wheel. Analogous colors of red are purple and orange. Analogous colors of green are yellow and blue. Each color has three characteristics. Hue– The hue of a color is what color family the color belongs to. Is it red, yellow, blue, green, orange, or purple? Value – How dark or light a color is. Chroma – Is the intensity of a color, how bright or dull a color is. Grays are essential to give your painting structure and depth. Grays are more than those neutral battleship grays. Every color has its highest saturation point or intensity. As the intensity of a color drops, it is referred to being “greyed down”. Browns are actually dark reds or oranges, where the intensity and value have been lowered. use this method to find the compliment of the color you are mixing. 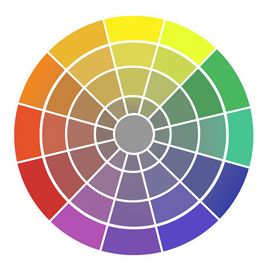 It will save you time from having to constantly look at the color wheel. So if you are using alizarin crimson which is a Red Violet and need to knock down the intensity and you done want it to change it’s hue too much add it’s compliment Yellow Green to the mixture. Learn your tertiary colors to have more control over you color mixtures. 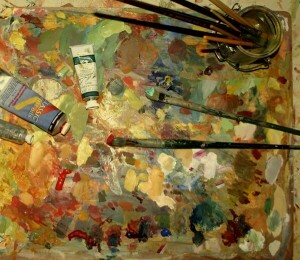 There are many great painting palettes. 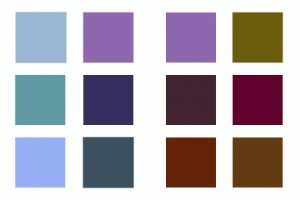 Certain palettes favor earth tones, others favor warm or cool color mixtures. I have used many different palettes, but the palette I have come to use most over the years is a warm and cool primary color palette. I mix secondary and tertiary colors from the primary colors. With this, I find I can achieve the widest range of colors. I can mix color schemes that lean warm or cool. 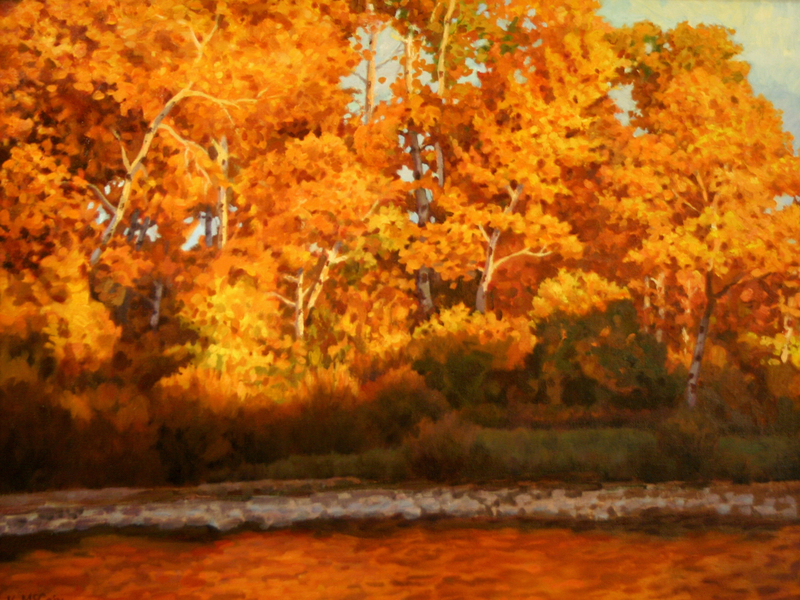 This isn’t just a palette that favors landscape painting. 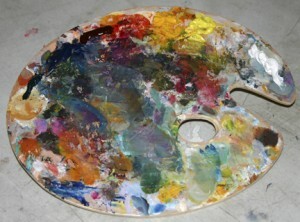 This palette can be used for portrait painting, landscape, or still life. The colors I use for my palette are very intense but I can mix them to create earth tones or grays. The colors I use are Cadmium Lemon Yellow or Cadmium Yellow Light, Cadmium Yellow Deep, Cadmium Red Light, Alizarin Crimson, Ultramarine Blue, Thalo Blue (Winsor Blue Green in Winsor Newton), Ivory or Mars Black, and Titanium White. Each one of these primaries lean warm or cool and are almost equally spaced around the color wheel. This way I can mix the most intense secondary and tertiary colors, as well as neutralize the colors into vibrant grays. I lay out my paints starting with white and moving through Lemon Yellow or Cad Yellow Light, Cadmium Yellow Medium or Yellow Deep, Cad Red Light , Alizarin Crimson, Ultramarine Blue, Thalo Blue, black and white. A few more things to keep in mind. Fill your palette with enough paint to finish your painting. I know as a beginner it can be hard to squeeze out a lot of paint. It’s like watching money spilling onto your palette. You don’t want to waste any of your paint because of the investment of made in your supplies. Try to resist the urge to put out little dots of paint. To mix colors you need a good amount of paint. Squeeze out more white; you will use this more than any other color. When painting in oil always dip you brush into medium or thinner first before dipping into your oil paint that will keep you brushes from getting built up oil paint in the ferrule of the brush which will keep your brushes in great condition for years. After painting clean up with thinner and soap and water. Hue- The hue of a color is what color family the color belongs to. Is it red, yellow, blue, green, orange, or purple? Grays are essential to give your painting structure and depth. Grays are more than those neutral battleship grays. Every color has its highest saturation point or intensity. As the intensity of a color drops, it is referred to being “grayed down”. Browns are actually dark reds or oranges, where the intensity and value have been lowered. Anytime you want to knock down the intensity of a color, in other words create “grayed color”, add the color’s complimentary color. For instance, if you want to make a red less intense add green and you will get grayed reds. Continue adding green and you will get brown, which is also a grayed red. The opposite is also true adding red to green will give you more subdued greens. Primary + compliment = brown. Brown + analogous color = more grayed, less intense color. Add white to change its value (lighten). This takes practice and experience. In our example above, where we grayed a red by adding green (its compliment) we can push it more towards neutral gray, by adding an analogous color, such as blue, and white. Again, with white you change the mixture’s value, with the analogous color (blue in this example) you change the color’s hue slightly. Keep going and eventually you will get a neutral gray, but notice the range of color between red and neutral gray. Use this technique to achieve colors in that range. Get out your paints and practice mixing color with their complimentary colors. See the variations of color you can make. The possibilities are endless.